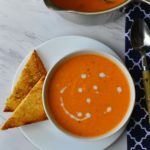 Creamy tomato soup made with ripe plump tomatoes and a piece of toast to dip and swirl !!! Isn’t that something you wish for to wash away the Monday blues! Yes I could definitely use some now ! Nothing, and I repeat, NOTHING from a CAN ever ever comes close! 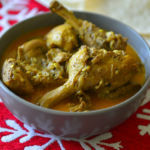 Creamy, sweet, tangy and aromatic – it is definitely a treat. 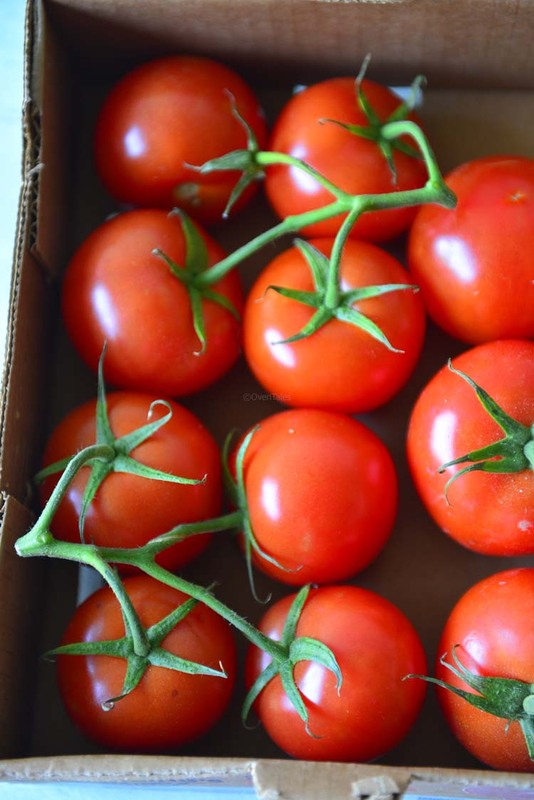 It is a little early for fresh tomatoes here, in fact I was just beginning to wonder when and where to plant a few plants for this year’s summer harvest. But if you you happen to come across a batch of these, and it seems like a tomato soup kind of day – go for it ! Usually this soup is something we make a few times in fall. When the tomatoes are plentiful and the weather is turning a bit nippy. But you can make these with frozen or canned tomatoes any time. This soup can be frozen as well. If planning to freeze I would recommend that you do not add the cornstarch or coconut cream and add these when the soup is reheated. How do you like your soup ? With grilled cheese sandwich or just plain toast or garlic bread or just a few croutons ?? Well you see a theme here ? 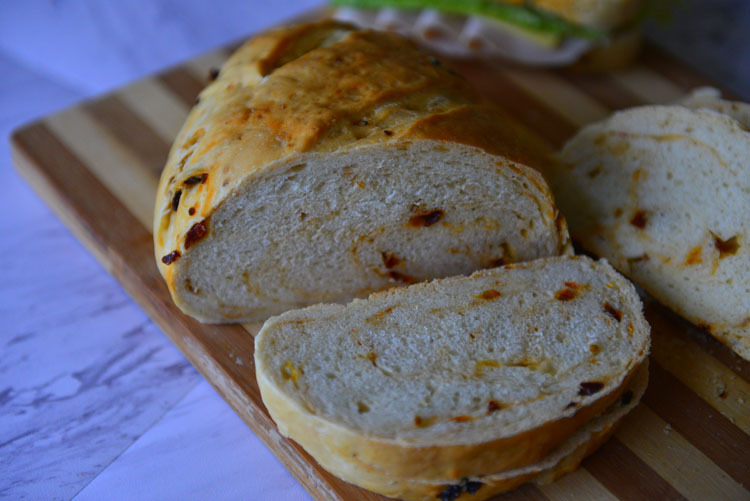 I love these with garlicky toast while my kids would prefer to have it with grilled cheese sandwiches. 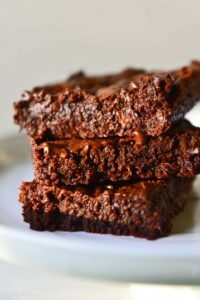 This is a vegan recipe. Why Vegan you ask ? Well, there is a little story behind this. I have a lot of friends who are vegetarians or who don’t eat meat. to Some it was a shock to find out t hat their favorite tomato soup was made with stock. To cut the long story short, when I replaced chicken stock it was an easy fix to replace the dairy cream. The cream part was easy, as any day I would prefer coconut cream to a dairy cream ! All these substitutions hasn’t taken away the taste – it is still creamy and satisfying! 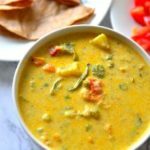 This plant based version works so well that my meat eating family does not seem to notice the vegan aspect of this soup – they eat it ‘coz it is delicious ! 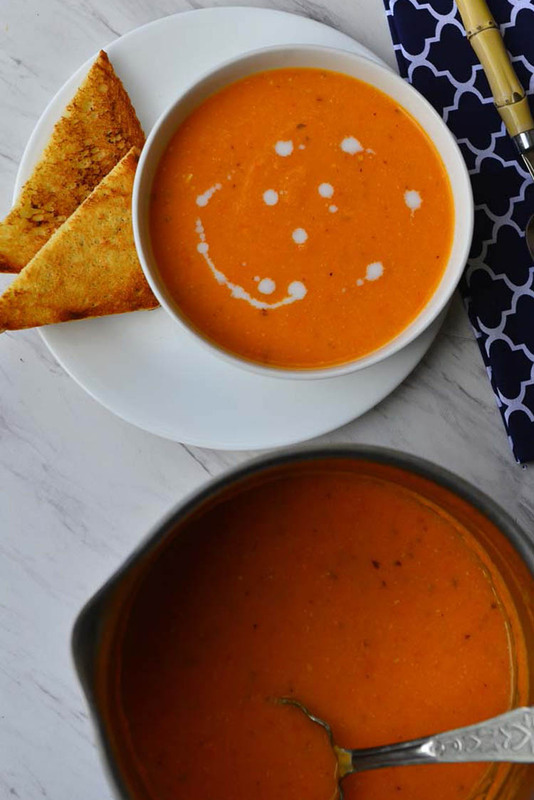 So here is my tomato soup recipe , vegan , fresh and absolutely delicious ! 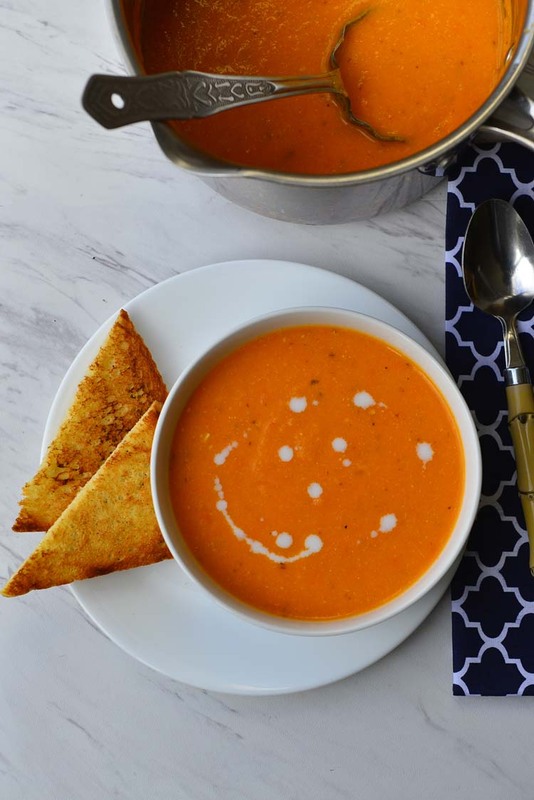 A creamy luscious tomato soup made with fresh tomatoes. 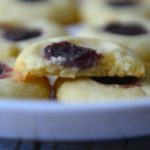 This vegan version is light and delicious ! Cut the tomatoes cross wise and remove the seeds and pulp. Cut each piece into quarters and set aside. Chop the vegetables , and crush the garlic. If using the cashew nuts soak it in water. Heat oil in a soup pot. When it becomes hot add the bay leaf along with crushed garlic. If using chili flakes add them now. Stir fry for a minute and add the chopped onions , carrots and celery. 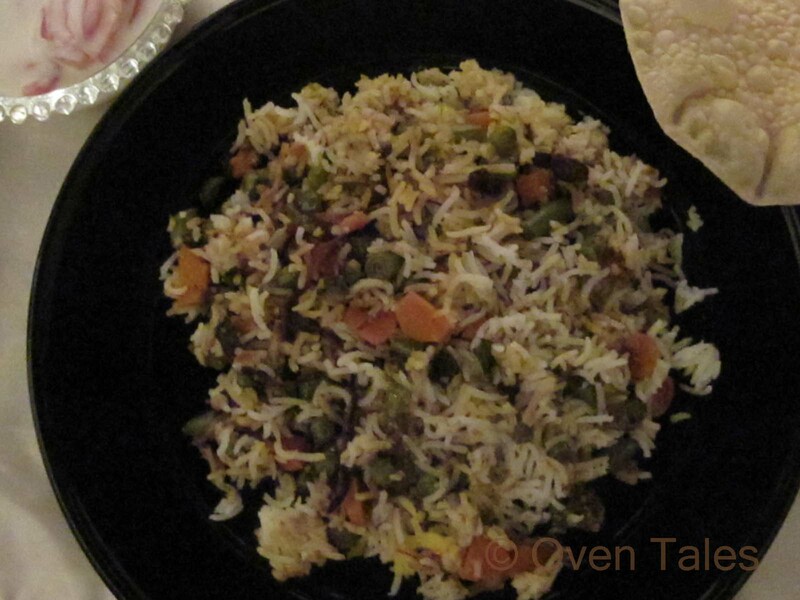 Sprinkle a little salt on top and cook for 2 to 3 minutes until the vegetables soften. Add the tomatoes cover with the and let it cook for 10 to 15 minutes until the tomatoes soften. Remove from the pan fish out the bay leaves. Transfer the mix to a blender and puree - or use an immersion blender to puree. Mix 1 Tsp corn starch with 1/2 C water . Grind the cashew nuts into a smooth paste. Return the puree to the soup pot, add enough water to bring to desired consistency. Add oregano. Turn on the heat and bring it a boil. Once it reaches rolling boil , add the ground cashew nut paste, stir the corn starch solution and add to the soup. Bring it back to boil and reduce to desired consistency. 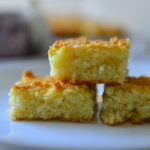 Stir in enough of the coconut cream (up to 1 c), I usually use 1/4 to 1/2 C depending on brand, for the desired creaminess . Taste and adjust salt and pepper. If the soup tastes sour mix in 1 tsp of brown sugar . For nut free version omit the cashew nut paste and increase the coconut cream. Adjust the coconut cream to your taste. The amount used also depends on how tart the tomatoes are. So here it is , get the bowls out and serve! Fresh, light and healthy and not to mention delicious! 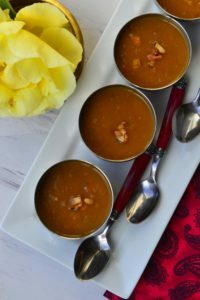 I’ve never tasted a cream base of coconut milk and cashews—I’m now very curious to taste how all the flavors come together in a tomato soup! Such a warm and lovely color on this soup. Nobody can say that it is vegan! Cashews add so much depth of flavors also. That is what my vegan friend said as well ! I am partial to coconut , so I would have picked this over the dairy version any day 🙂 . I made this and honestly I wasn’t sure about the coconut, but it was really good! I will definitely be making this again. So glad you liked it ! Thank you ! What a beautifully colorful soup. Love the rich tomatoes. 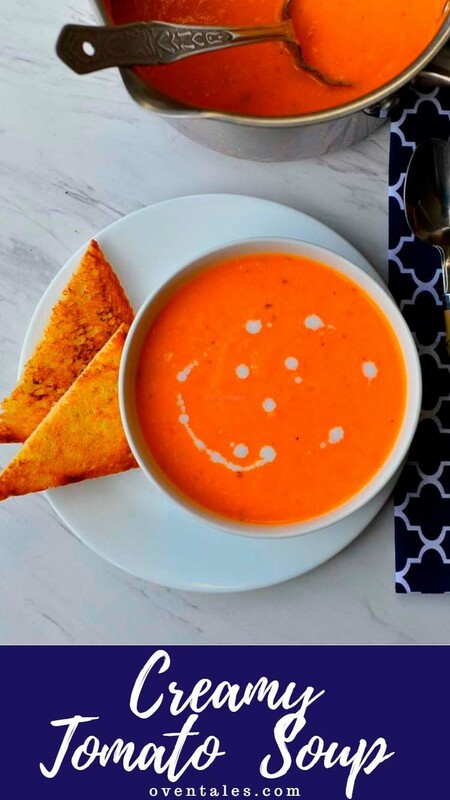 What a delicious Creamy tomato soup! I simply cannot wait to try it! Very interesting combination of ingredients. I am saving this recipe for later. Coconut cream is my favorite as well 🙂 Thank you !